If you read the Porto piece yesterday, you would have seen the story of a player who lasted just 16 minutes at Rayo. But he was competing for the Q letter with another player, who lasted slightly longer - 58 minutes, to be exact. Felipe Miñambres, our ex-sporting director, once said that "we can't offer potential new players anything tangible; what we can offer them is affection and a shop window". Hugo Álvarez Quintas made just one league appearance for Rayo, and yet he deserves an entire article. And that's because he represents another facet of Rayo's transfer policy - the facet of resignation at the prospect of losing all their best players. This is the story of a player who used Rayo as a springboard for his career. Born in Vigo, Galicia, Álvarez made his senior debut with Tercera side Las Rozas, after playing youth football with Celta de Vigo and Real Madrid. He first arrived in Segunda B in the 2006 summer by signing for Rayo Vallecano, but played in the Tercera with the reserves. His 58 minute cameo came in the second game of the season at Gimnástica de Torrelavega, and that too because Carles Llorens had been sent off and defensive cover was required, with midfielder David Cubillo being sacrificed. 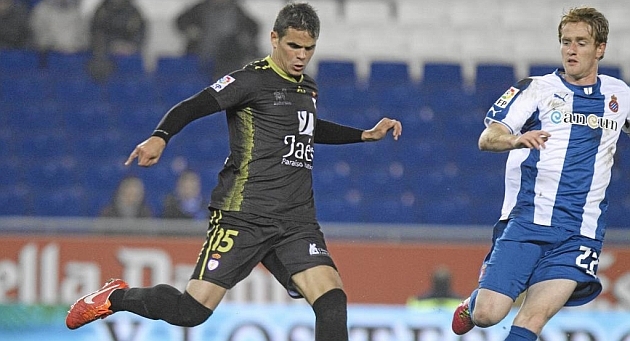 (He also played 70 minutes in the Copa del Rey, starting at Lugo). Despite playing just once in the Segunda B, and yet Segunda B clubs knew he was too good for the Tercera. And the shop window had his name written all over it. In 2007, Leganés took the 22-year-old on for a season, and for the next six seasons he would represent six clubs in the division. At Alcorcón, during the 2008-09 season, he broke out and became a Segunda target, with offers from Levante and Gimnàstic. However, his agent was unable to secure a deal, and he went into self-imposed exile in Nicosia, Cyprus, where he finished his law degree and improved his English. Six months later, Zamora rescued him, and he would play the latter half of the 2009-10 season with them. He had to re-establish himself in the division, and stints at Almería B (2010-11), Real Unión (2011-12) and Cartagena (2012-13) followed. It was at Cartagena, a team that had just been relegated from the Segunda, where Hugo Quintas attracted the attention once again of Segunda clubs. He became the pillar of a team that reached the promotion playoffs, and clubs started to, once again, notice the qualities of the defender who was both quick across the ground and strong in the tackle - not to mention his uncanny ability to "rise-like-a-salmon" despite being just 6 feet tall. And in July 2013, Álvarez joined Real Jaén, who were freshly promoted to the second level, and finally became a professional at the age of 28. He would appear regularly for the club, and despite being relegated at the end of the campaign was able to find another Segunda team to play for. In 2014, he joined Real Murcia; however, after their administrative relegation, he terminated his contract and signed with Tenerife in the same tier that year. Quintas has been a Segunda regular ever since. He played for Elche during the 2015-16 season, for UCAM Murcia the following season, which ended in relegation, and now plays for former club Alcorcón. Before this season, he had never played at a club for more than a season - playing for 12 clubs in 12 seasons - and he is an established professional footballer. And all because Rayo Vallecano gave him an opportunity to prove himself. They gave him affection. And a shop window.